If you’re dreaming of a romantic weekend, Venice is the ideal place where to spend a magic stay and Locanda Ca’ del Brocchi is the ideal romantic B&B where to book a room. You’ll find a romantic atmosphere as soon as you get here, as we are located in one of the most picturesque areas of Venice, among “calli” (Venice typical narrow streets) and the “campielli" (squares) of Sestriere di Dorsoduro, located near to the Academia, the famous museum. The room for your weekend in Venice will be as romantic as the city can be: the typical Venetian 18th century style furniture with chandeliers made in Murano artistic glass and all the modern conveniences will welcome you in a fairy-tale atmosphere. You can choose between the room with an ancient fireplace or the charming junior suite to impress your beloved. 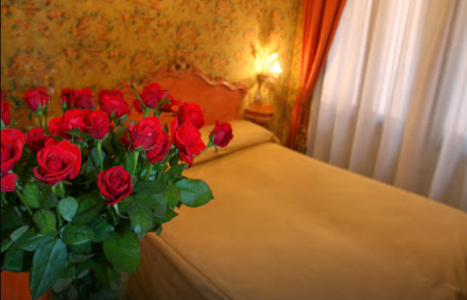 All Ca’ del Brocchi B&B rooms are romantic! Locanda Ca’ del Brocchi’s staff will welcome you cordially and professionally; the owners personally take care of the B&B and want their guests to feel at home. You’ll also be offered all the services usually provided by Venice hotels: breakfast, free Wi-Fi in the whole building and room service (paid) for a toast to love in your romantic room! Book here your romantic weekend in Venice!